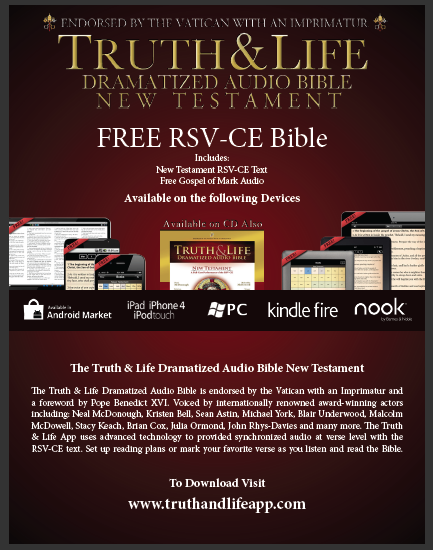 Truth & Life Dramatized Bible – Endorsed by the Vatican with their Imprimatur. This is a great new product. 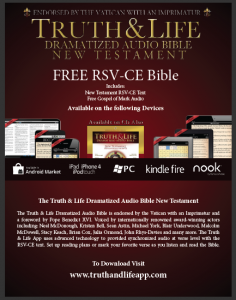 It is the whole Catholic New Testament read/acted so you can listen in your car, at home, on your smart phone or anywhere. Download part of it for FREE. There are background sounds to bring the Scriptures to life. I love this new audio series and listen to it all time. Check it out by clicking on the image to the right.